Learning how to draw gorillas is one of the more difficult drawing tasks unless you are drawing a cartoon gorilla. Like anything else, the gorilla is made up of shapes. In fact, gorillas are mostly made up of ovals, circles, and curved lines. Keep your lines light so that they can be erased easily later. The lines in this drawing are dark, but that is so you can easily see what has been done. Begin with an egg shape. The small end of the oval should point up to the top of the paper. 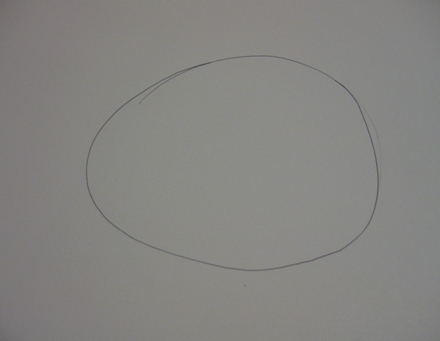 Next, draw another oval for the head. Overlap the body quite a bit. Gorillas do not have much of a neck. Remember to keep your lines light because you will be erasing many of them later. Now, draw a curved line toward the top of the head. Add two small circles on either side of the head to make the ears. Add a peanut shape for the nose. This should be drawn just about at the place the top part of the body oval hits within the head oval. Add nostrils by making two curved lines at the bottom of the nose. Add two lines to create creases on the forehead. Add eyes by drawing two small circles on top of the nose. Draw curved lines on either side of the head, just in front of the ears. This will give the face shape. Draw a line from the nose to the mouth area and then finish with whatever shaped mouth you want your gorilla to have. At this point, you can color in areas of the head and face if you like. You can also add a triangular shape to make the bridge of the nose if you so choose. You don't have to. There is no right or wrong way when you are learning how to draw. Gorillas are individuals and each looks different in the real world. Figuring out how to draw gorillas' feet and hands is the most difficult part whether you are drawing a cartoon or a realistic image. Use ovals for the feet and rounded triangles for the hands. Draw in the toes and fingers. Remember that the hands and feet of primates are similar to those of humans. Study your own hands to see what shapes to use. Finished! Draw in whatever details you like. Perhaps your gorilla has a belly button, a hat, or a vest. Use you imagination to create a personality for him. This type of drawing makes a good coloring page for kids. Keep practicing and you will know how to draw gorillas in no time, or check out our step by step slideshow on How to Draw a Rose for more sketching tips.